The Cassini spacecraft has obtained new images of Saturn's auroral emissions, which are similar to Earth's Northern Lights. 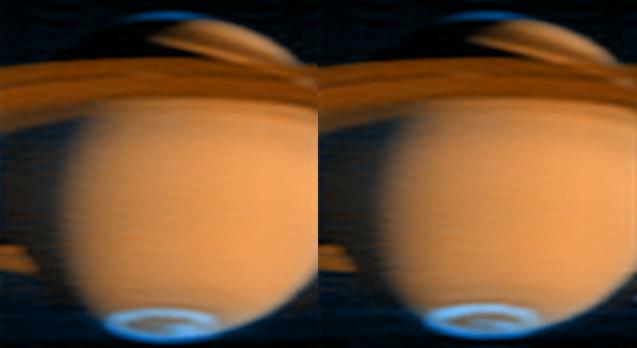 Images taken on June 21, 2005, with Cassini's ultraviolet imaging spectrograph are the first from the mission to capture the entire "oval" of the auroral emissions at Saturn's south pole. In the side-by-side, false-color images, blue represents aurora emissions from hydrogen gas excited by electron bombardment, while red-orange represents reflected sunlight. The images show that the aurora lights at the polar regions respond rapidly to changes in the solar wind. Previous images have been taken closer to the equator, making it difficult to see the polar regions. Changes in the emissions inside the Saturn south-pole aurora are visible by comparing the two images, taken about one hour apart. The brightest spot in the left aurora fades, and a bright spot appears in the middle of the aurora in the second image. Made by slowly scanning the ultraviolet imaging spectrograph instrument across the planet, the images contain more than 2,000 wavelengths of spectral information within each picture, which helps researchers study Saturn's auroras, gases, hazes and their changing distributions. Like Earth's aurora, those on Saturn form in an oval at high latitudes around each pole, along with associated spots and streaks. The ultraviolet imaging spectrograph data shows that the Saturn aurora lasts at least one hour, but small changes are visible in that time between the two images. The same process produces auroras on both planets: variations in the plasma environment release trapped electrons, which stream along the magnetic field lines into the upper atmosphere. There, they collide with atoms and molecules, exciting them to higher energies. The atoms and molecules release this added energy by radiating light at particular characteristic colors and wavelengths. On Earth, this light is mostly from oxygen atoms and nitrogen molecules. On Saturn, it is from emissions of molecular and atomic hydrogen. The Cassini-Huygens mission is a cooperative project of NASA, the European Space Agency and the Italian Space Agency. The Jet Propulsion Laboratory, a division of the California Institute of Technology in Pasadena, manages the Cassini- Huygens mission for NASA's Space Science Mission Directorate in Washington D.C. The Cassini orbiter was designed, developed and assembled at JPL. The ultraviolet imaging spectrograph was built at, and the team is based at the University of Colorado, Boulder. For more information about the Cassini-Huygens mission visit http://saturn.jpl.nasa.gov . The ultraviolet imaging spectrograph team home page is at http://lasp.colorado.edu/cassini .